This bit of news was leaked via Twitter yesterday, but it was made official today via the USHL Hockey Ops Twitter account. The Lincoln Stars have acquired the rights to '94 forward Ryan Lomberg from the Muskegon Lumberjacks in return for a conditional 11th round pick in the 2015 USHL Phase II draft. The native of Richmond Hill, Ontario, Canada last played for Muskegon back in 2011-12, where he was the team's leading scorer with 40 points (22g, 18a) in 52 games played, to go along with 154 penalty minutes. For the past two seasons, Lomberg has played college hockey at the University of Maine where he scored 32 points (18g, 14a), and added 82 penalty minutes in 66 total games played. Jeff Cox of the SB-Nation College Hockey blog broke this story yesterday, so I'm going to copy-paste his article below since he did a good job summarizing why Lomberg became available after completing his sophomore season at the University of Maine. 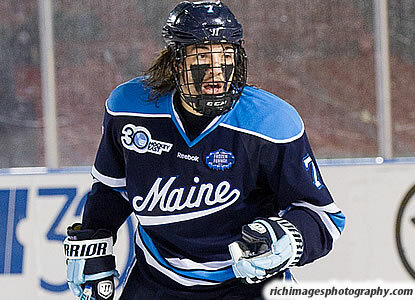 Acording to multiple sources, suspended Maine forward Ryan Lomberg could be on the move to the USHL. The Lincoln Stars will acquire the rights of the Richmond Hill, Ontario native from the Muskegon Lumberjacks. Lomberg was suspended from the hockey team pending an assault charge against him stemming from an off-campus dispute back in April. He has plead not guilty in Penobscot County Court to the charges. According to several sources and police documents, the incident was provoked by an argument over an acquaintance's dog. A University of Maine athletic spokesperson said the hockey program has no comment on the matter at this time. This transaction doesn't mean Lomberg is leaving the school or the hockey program, but it certainly points in that direction. A '94, Lomberg has one remaining season of junior eligibility. Lomberg, Maine's third leading goal scorer as a sophomore, had 11 goals and seven assists in 34 games. A graduate of the Hill School in Ontario, Lomberg scored 22 goals and added 18 assists in 52 games played for the Muskegon Lumberjacks during the 2011-12 season. Jeff Cox tweeted last night that sources at the University of Maine told him that Lomberg is likely off the team and will report to Lincoln. Okay, now my thoughts. I'll be the first to admit I don't know all of Lomberg's story. There are a lot of articles out there on the internet about his recent legal issues, and I've read the majority of them. I'm a bit hesitant to give my opinion here because there may be more to the story than what has been reported in the media. However, on paper, I'm not sure I'm a big fan of this acquisition. Considering the recent legal trouble of two former players, I'm a little surprised the Stars would take on a player who as far as I can tell, is awaiting trial for assault and disorderly conduct. The addition of Lomberg, in my opinion, is a bit of a head scratcher. Why add to the negative attention (warranted, or not) the team is getting as of late. But as I've said plenty of times, I'm just an idiot with a blog. Maybe I don't know all of the story. I can only trust that the Stars have done their due diligence. It will be interesting to see how this all plays out over the summer. I will post any updates here on the blog as soon as I'm aware. Agreed, Yeti. I don't believe this move should have been made until his legal proceedings are complete. Isn't that why the other two Stars players aren't playing hockey? Why is this different?